(Photo credit: Tom Casino/Showtime) LONDON (24 Oct) – Boxing’s oldest ever world champion Bernard Hopkins has his eyes on a superfight with pound-for-pound ace Floyd Mayweather should he get past Karo Murat this Saturday night live on BoxNation. 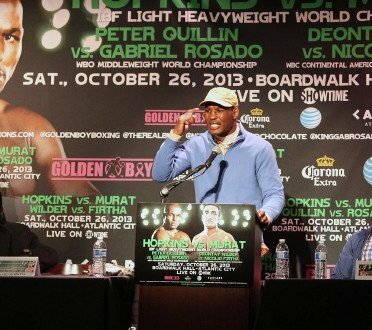 The 48-year-old displayed his usual calm demeanour during the pre-fight press conference ahead of his IBF light-heavyweight world title clash at the Boardwalk Hall in Atlantic City this weekend. Over the past few weeks there has been speculation linking the Philadelphia legend with a potential matchup against the mercurial Mayweather, pitting two boxing greats against one another in a fight that would certainly generate global interest. Despite the obvious weight differences, Hopkins has looked to clear up talk of a fight between the two boxing icons, admitting that it is something which has been put to him. “Well, first of all I had no conversations, but it was a conversation said to me, and that’s why I responded,” said Hopkins. “And when I realised that there is a fight that they owe him in May of next year, and whether I’m willing or can I make 160, and I said, well, if I have that much time, a guy like me, the way I live and the way I keep my body right, even six pounds from fight night next week, sure,” he said. “They didn’t act like they were joking, and we’re talking powerful people. So I’m sitting back saying, “Okay, hey, you know,” because no one else is going to beat Floyd Mayweather in their 20s and even in their early 30s. After having shared the ring with the likes of Roy Jones Jr, Oscar De la Hoya and Felix Trinidad, a fight with Mayweather would add one last historic name to Hopkins’ résumé but would mean having to move back down to the middleweight division where he made his name. “I would love to put a feather in my cap to go down two weight classes after coming up two weight classes to make history with [Antonio] Tarver, almost six, seven years ago. I mean can you imagine the ‘All Access’ [Showtime build up show]? Can you imagine the promotion for that fight? Because I’m not a shy guy and I don’t have a shy camp,” he said. “But I keep reminding people, okay yes, there’s a possibility of anything. I’m not chasing anybody. I’m not standing in line for anybody. I’m not trying to pick on the little guy. But if you can find somebody that people want to see fight after that performance [Mayweather’s last fight], masterful performance of a king chess player that we witnessed less than two months ago – good luck,” said Hopkins. With over 20 years experience as a professional Hopkins knows more than most about overlooking an opponent, something which he isn’t doing with the seasoned Murat, a man who can derail any future money fights. “Right now, Saturday becomes a thing – I can let everybody off the hook if I just get brain dead Saturday night and they be saying, “Okay, got him out of the way”. So trust me, Karo Murat is not a guy I’m sleeping on and under estimating, and he’s going to see that early. “Can’t nobody fight for me. Can’t nobody fight for him,” added Hopkins. Watch Hopkins vs Murat live and exclusive on BoxNation (Sky Ch.437/Virgin Ch.546) this Sunday at 2am. Visit www.boxnation.com to subscribe.